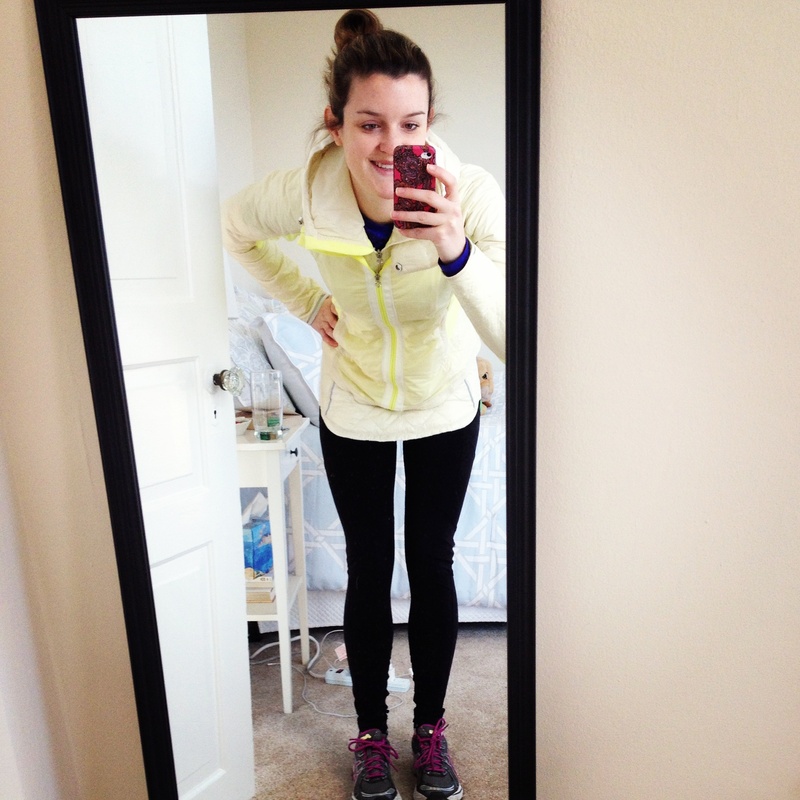 January | 2013 | Fit Girl. Happy Girl. When you register for Big Sur you have some idea of what you’re getting yourself into- hills, lots and lots of hills. In fact, it’s known for the infamous Hurricane Point, a two-mile long stretch around mile 10 that has runners climbing 520 feet, but they swear the view at the top is worth it! Well, I grew up and lived in eastern Massachusetts my entire life and while we do have some significant hills, they are mostly rolling hills. So when I moved down to the Lehigh Valley in Pennsylvania for my job at Runner’s World, I knew the hills were going to be a shock to my running system. I was scared, I’ll admit it. 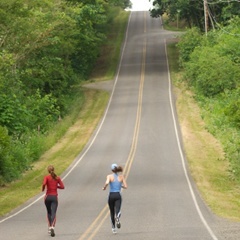 I’ve never been a huge fan of hills and my cousin, and closest running buddy, can attest to that. Whenever she suggests a race I ask- are there any big hills or is it mostly flat? But now that I live in the hilly valley and am training for a very hilly marathon, there’s no more avoiding the hills. Yesterday during lunch I went out for a run with a few of my coworkers to tackle a monstrosity of a hill- the 10th Street Hill. This hill has roughly the same elevation gain as Hurricane Point but over about half of the distance. So, it’s steeper but shorter. I knew it was going to be really hard but after my hilly 14-miler last Sunday, in which I ran all of the hills, I thought I’d be ok. I told myself it would be fine if I had to walk part of it or maybe run the flats and walk some of the hills. Take it easy, find a rhythm and breathe. We did a 1-mile warm-up around the neighborhoods and then as we began to head up 10th Street, Tish Hamilton, an executive editor at Runner’s World, gave me a run down of what was ahead. She said we’d start to climb a hill, then there would be a false flat, followed by a steeper hill which would take an almost 90 degree turn to an even steeper hill that would climb to the top. I was glad to have an idea of what was ahead but I honestly wasn’t expecting it to be as steep as it was. I had to walk about half of the distance and even walking it was a hard effort. It took me awhile to get to the top but once I got there, after running the last incline, I felt proud. Yes, I had to walk some of it. Yes, I was disappointed because everyone else was able to run the whole thing. But this was my first attempt and a first attempt is better than no attempt. We finished the run with an additional hill and then started our descent back down. The whole run was just over 5 miles for me (the other ladies did one repeat at the last hill) and I finished feeling good. More importantly, I finished knowing I was to try it again and again until I can run the whole thing. Did I mentally psych myself out? Yes. Could I have pushed harder? Probably. But for me, the key with training for this marathon (my first marathon) is to get to the starting line healthy and prepared. This won’t be the last time I see the 10th Street hill, in fact I’m going to incorporate it into my training as much as possible, but it was the first time and it’s only up from here. Until we meet again, 10th Street! My run included 2 miles of very peaceful trails along the river. 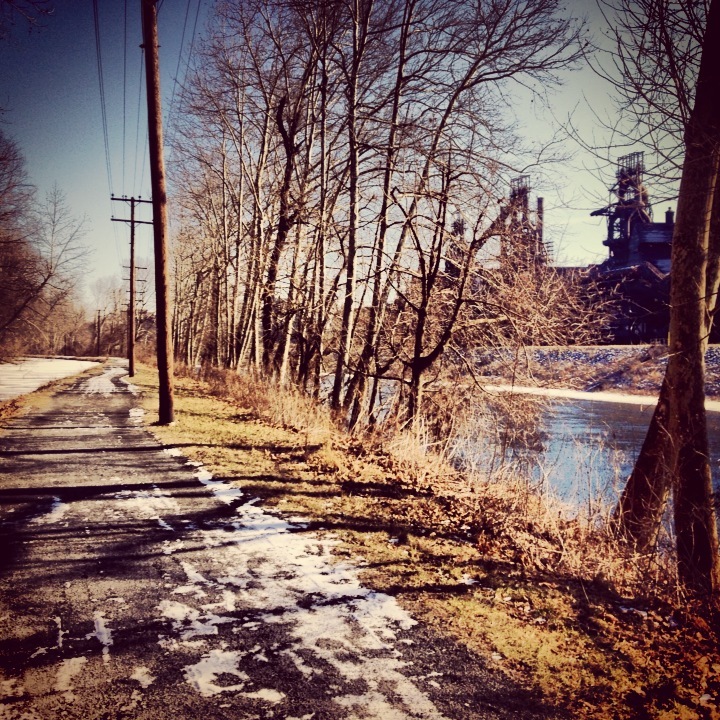 I ran 14 miles this past Sunday on a chilly, yet very sunny, eastern Pennsylvania morning for Big Sur training. I’ve tackled a 14-mile run only once before- last September- while keeping my cousin and friend Lindsey company on a long run for their first marathon. But last Sunday was the first time I’ve ever tried the distance solo. I’m actually a big fan of solo long runs. I might not be saying that when it comes time to run 18 or 20 miles but for now, and in past half-marathon training cycles, I’ve thoroughly enjoyed it. I get a lot of thinking done during these runs- about work, my family, friends, this blog, what I’m going to eat post-run and everything in between. I also listen to music and am guilty of singing along out loud during my run. While the time spent during the long run is enjoyable, it can only be made possible by properly preparing yourself mentally beforehand, in my opinion. Instead of the fervent watch-checking and constant song-changing, opt to settle in for the ride. That’s what I tell myself at least, in preparation of a long run. I know it’s going to be long, I know it’s going to take a lot of energy but I know it’s going to be a fun and probably memorable ride so I settle in to my comfortable pace, sit back and enjoy as the miles fly by. How do you mentally prep for a long run? 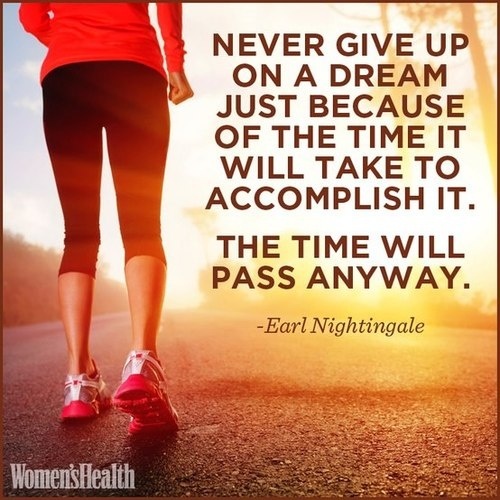 Dreams and big goals take time and hard work to achieve. A friend this weekend said she couldn’t imagine training for a marathon because of the time it takes. To me, I know it takes a lot of time, but that’s what makes the achievement and success of finishing 26.2 miles even sweeter. 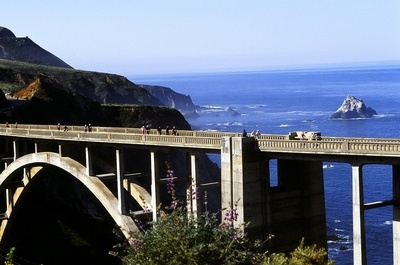 So, there’s no way I’m giving up on my Big Sur dream. I’m going to enjoy the crazy ride that is training and relish in the finish line. 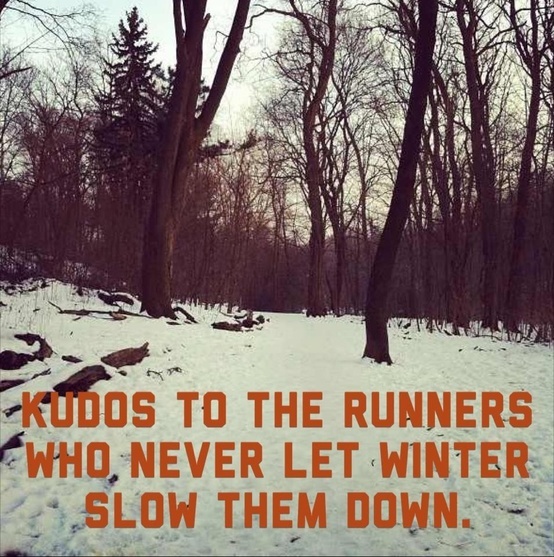 Dream big and happy running! As I enter into week 1 of Big Sur Marathon training, I wanted to ask the Twitter-sphere what are the absolute essentials (gear-wise) for marathon training. Clearly, a water bottle and GPS watch are favorites, but there are others too! – H.M.
@FitHappyGirl water bottle! Garmin, music (for me at least), great socks, COMPRESSION SOCKS/SLEEVES- an absolute must! foam roller! @FitHappyGirl Handheld water bottle or water belt. GPS watch, all the way. And some way to carry phone in case of emergency. @FitHappyGirl Nathan water belt and @TPtherapy ultimate six kit. Better than just foam roller IMO! I took it as a sign and ran only three times total last week- my lowest mileage week in a long time. But I’m not dwelling on it because my body needed that rest more than I thought. However, I was able to get in one long run which will be good to keep my fitness up. Monday- 45 minute boot camp class at the Energy Center- this class was really good because I need to get back into strength training more. I used low weights and the instructor gave me some modifications because she knew I ran the half-marathon last Saturday. Tuesday- 3 miles on the treadmill- I wanted to do an easy few miles to see how my legs were feeling post-half. They felt great when I was actually running but after I was finished they were sore. Wednesday- Did yoga for recovery- I planned on running but decided not to because my quads were still really stiff from running. Thursday- 3 miles easy during lunch- This run felt really great. I kept an easy pace, although I didn’t actually track the run with my watch, and just got out to shake out my legs. Friday- REST- I decided to make an impromptu trip back to Massachusetts this weekend because I thought, once marathon training really gets going, who knows when I’ll be able to get home. So, I spent most of Friday driving. Saturday- REST- When I’m home, I like to spend as much time with my family as possible and on Saturday, that meant spending the day in Boston with my mom and sister. We did a lot of walking though, so maybe I got some miles in! Sunday- 10 mile long run- I was determined to get a long run in this weekend and I did today. I ran 10 miles easy and my pace ended up being even slower than easy pace for me because the 20-30mph winds with gusts of 50-60mph made it REALLY difficult to run any faster! I felt really good though, didn’t have to walk at all and the weather was beautiful! Also, it’s my birthday so I was really excited to get some miles in! Big Sur training officially begins this week and I’m really excited to keep y’all up-to-date! Happy running! I missed the Friday Faves last week because I was in Florida for the Walt Disney World Marathon weekend but I thought I’d give an extra awesome-packed five tidbits from this week today! In case you missed my announcement yesterday, I’m running my first marathon this spring! 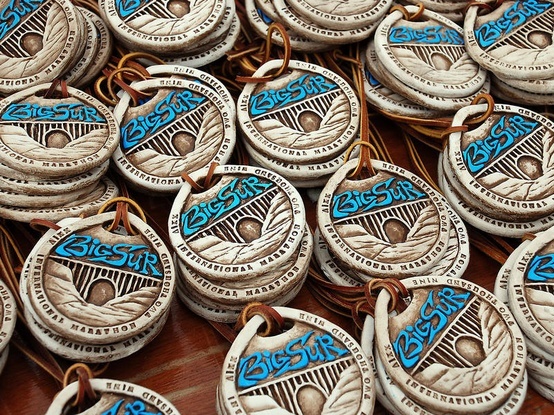 – Running the 2013 Big Sur International Marathon via me! Disney-themed Gu flavors thought up by your favorite editors (because we’re just so damn clever) – Runner’s World Editors Take on Naming Disney-Themed Gu via me! I’ve had a mix of emotions going into writing this post- I’m terrified, excited, confident, determined but mostly scared. But, I’m putting it out there and it’s happening, I’m running my first full marathon this spring and it will be the Big Sur International Marathon on April 28. I know- Big Sur is probably not the best first-timer course; it’s extremely hilly, the conditions vary (a few years ago part of the course was wiped out by a landslide) and it’s just plain hard. But, it’s also a destination race, a race that is on thousands, maybe millions of runners’ bucket lists and I have the opportunity of a lifetime to run it with the Runner’s World Challenge, so that’s what I’m going to do. What’s that annoying saying again? Oh yeah, YOLO (you only live once). Over the last few weeks leading up to the Walt Disney World Marathon weekend (in which I ran the half and PR’d by 17 minutes, cough, cough) many of my co-workers at Runner’s World have been insisting I run Big Sur. “This is a once in a lifetime opportunity,” they said. “You may never get this chance again,” they said, trying to guilt-trip me. Thanks, guys. “You’re running it,” one flat-out said. My parents think I’m over-doing it and have asked me why I don’t just stick to half-marathons for a while. My dad, a 16-time 26.2 veteran, even said I should wait to run my first marathon. I get it, they are parents, it’s their job to worry. But in all of this persuading me to run or not run the marathon I realized I’ve only been listening to other people when I should really be listening to myself, to what I want to do. The truth is, my 2013 goal was to run my first marathon, and I just assumed it would be in the fall. But there is no reason I’m not ready now, so I’ve decided, whether people like it or not, I’m running it. What do I have to lose? My goal is to simply finish, no goal time in mind and to enjoy the entire experience. My friend Lora, who will BQ at the Eugene Marathon on April 28 (same day as Big Sur! ), posted an inspiring quote on the interwebs the other day that more or less sealed my decision. @GPescatore @meghgrace @cowboyhazel @caitlingiddings All #DisneyGU available in Lion King Size!